Looks a bit cheerful outside at the moment There is some blue sky and sun is shining. However today is still a cold day witn only temperatures of about 2 C , so that isn;t much. It is no garantee that winter will stay away now, we can have it back in no-time if wind direction changes and that can even be in March or even later. But I am not thinking of that. We just hope, that raise of temperature will hold on and stay for some time steady and that after that we will get some nice Spring weather. Hope makes us live, isn't it? It was quiet here this week and yesterday I really had an off-day. I wasn;t feeling great, not that I could pinpoint it, and was sleepy along the whole day. Later today Jan and I have to go to city center to buy us a new vacuum cleaner. Always there are things happening you didn;t count with but cost some extra money. Hope we quickly find one, that does the job well, and doesn;t cost all too much. I think being out in the fresh air will do us both some good, as long as we wear warm jacks and scarfs. This weekend on Sunday Jan will have his birthday and we will have both the same age again LOL! Not doing anything special, he is working that afternoon at the elderly home, doing his volunteer business, so guess he will be happy to come home and eat something and have first a nap on the couch. But I will think of something nice for him to eat. So I won;t linger too long today, cause i want to go not too late and still have to get dressed and somethng to eat before. Hopefully next time my post will be a bit more interesting. 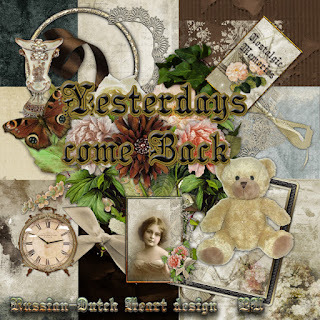 The kit for today is "Yesterdays come back". As the title gives away it could be a kit for some nostalgic layouts. Good morning Kyra. What a lovely little kit. That vase is gorgeous! I'm with you. I'm hoping we get a nice long stretch of "not too bad" weather and temps and then maybe Spring will come early. haha. We can dream. Today here is cloudy, but not raining (yet). I did not go out yesterday to do my errands, so I will have to go today. Pogo has used up the last of his doggie food. I've just spent the whole morning trying to straighten out my meds with the insurance company and the pharmacy. I don't understand. They always find a way to make a very simple transaction into a very difficult project. Ah well, I'll get it all straight. You have a wonderful day my friend, and Happy Birthday to Jan. Hugs, Edna B. Your weather sounds like ours, about the same temperature and gray... We will not see Spring for a couple of months, except that the snow will gradually get wetter. What we have now is very dry. I love to walk through the piles and kick up a cloud! Thank you for another wonderful kit. This will be perfect for pictures of grandparents. Hello Missy! Thanks so much for the lovely gift, I work a lot with photos of yesterday, so will be perfect as usual! You are so kind to generously give it to us! The weather here is still on a very erratic roller coaster, on day we have 80F and break records for high that date in history and the next we drop 50 degrees and break the low records....CRAZY....and so many people filling up the hospitals because of illness. I am so glad to be retired and not HAVE to go out when it is so frigid. Happy Birthday to Jan and hopefully you will enjoy the day together and find the perfectly priced vacuum! Thank you Kyra, for the lovely new kit. Our Snow is starting to melt away. Hopefully the large mounds we made by the using the plow will go away quickly since the one dog has figured out to climb up and jump over the fence. Not a good little doggie! NS THEY ARE ALL 3 SMALL DOGS BUT THEY ARE STARTING TO fall through the crust. Eve my little Phoebe who can't weigh more than a pound and half. Hello and Thank you Kyra for this wonderful download. I hope you are feeling much better today. I am hoping that today is a great one for you with a bit warmer temps. Happy Birthday to Jan! I am sure that you cooked him an awesome meal. Thank you so much for the wonderful kit. It is such a nice gesture of a gift that you do this for us.